My last post was about a landbot was able to buy for only eight cents the Second Life™ land that I had planned to sell for $150. Today I wrote a column on examiner.com that tells more about it. You can read it at www.examiner.com/second-life-in-national/don-t-let-a-landbot-take-your-second-life-land. Landbots have been a problem in Second Life for at least four years. Linden Lab won’t do anything about it. Opinions about it range from outrage that a landbot can take your land instantly if you make a careless mistake to smug belief that if you made the mistake, you deserve to lose your land. I believe there should be a waiting period after it’s marked for sale before it can be purchased. Not a long period, just a few minutes, to give the seller the opportunity to find their mistake and correct it. At the very least, the seller should be warned before completing the transactions that there are landbots who will buy the land instantly if there are any errors made in marking the land for sale. For me, going for two days believing I had lost my land and not even able to enter the land because the buyer had banned entry was like electroshock treatment. I had been planning on buying a Second Life private region, but cancelled those plans and instead have begun creating my own OpenSim virtual world that will soon be on the hypergrid. I’ll be writing a lot more about the process. This doesn’t mean I’m leaving Second Life. I love Second Life and have no intention of leaving. I had been looking forward for months to buying a sim and developing it, but I’m finding that creating an entire new world is even more of a thrill, not to mention a lot cheaper. I’m fortunate in having the technical skills and computers to host it myself, so my currently four sim world has so far cost me exactly nothing. Can someone really take your $150 Second Life land from you for only eight cents? Yes they can. When Saturday morning dawned, Hawk Lightcloud was looking forward to a starting his eighth year in Second Life by buying a full region with two friends. They intended making a beautiful place that would enhance Second Life. He had sold 75% of his Second Life mainland property a few days before and was marking the final two parcels for sale before buying his new region. That’s when everything changed. This picture shows the result: Hawk has lost his property and is prevented by red ban lines from even entering it. Hawk got up early, before breakfast, to mark his land for sale, but the moment that he was marking the first parcel for sale, there was a distraction and he marked the sale price as 20 Lindens instead of 20 Lindens per square meter. It was a simple mistake, easily corrected… or would be if a landbot wasn’t lurking, waiting for land to come up for sale cheaply. Hawk marked the land for sale and then checked to make certain that it was done correctly… and found that the land had already been sold, for 20 Lindens, to a waiting landbot. It was instant. The land was purchased literally the second that it was marked for sale. There was no opportunity to make a correction. Contacting Second Life support produced no results and filing an abuse report only got an automated response. Frustrated, Hawk put up signs next to the property telling what happened. The owner of the landbot responded by threatening to charge him with harassment. Hawk is now so upset that he’s not only probably going to cancel buying the full region, he may sell his last remaining Second Life property and cancel his premium membership. It’s been very unsettling learning how easily land can be taken. Can someone really take $150 land for only eight cents without the owner’s permission? I’ll write more when I know how it turns out. By way of full disclosure, the reason I know so much about Hawk is that I am Hawk Lightcloud. He is my oldest Second Life avatar, and is the avatar I use for owning land. Posted on April 18, 2011 Author Erik Gordon Bainbridge (Apollo Manga)Categories UncategorizedTags Second Life LandLeave a comment on Can someone really take your $150 Second Life land from you for only eight cents? Yes they can. I contacted Second Life support as soon as they opened this morning, and was told by MichaelS Scout, “If you’re concerned, be patient”. There seemed to be no concern about my land being either stolen or transfered through a Linden Lab error. I was selling this and neighboring land so I could buy a full region. Now I’m afraid to mark the other land for sale and I’m having major second thoughts about buying a full region. The land that was stolen or erroneously transferred is Hawk’s Roost in the Benten mainland sim. The teleport link is slurl.com/secondlife/Benten/210/41/24 if anyone wants to check it out. The land was owned by my Hawk’s Land group, but is now owned by the Voomland group. I’ll post more information as soon as I get it. 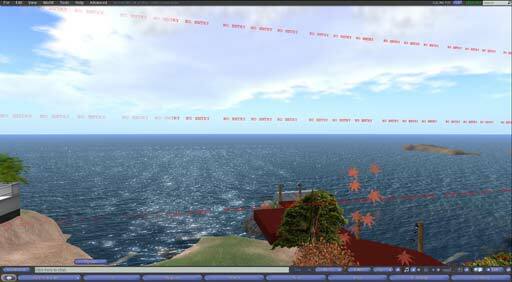 Some of my land on the Second Life mainland may have been stolen this morning. Either that or it’s a major Linden Lab error. I’m writing this now so others can beware until I find out what caused it. What happened is that I marked 2496 square meters of land for sale in the Benten mainland sim for 20 Lindens per square meter, but instead of going up for sale, the land ownership was INSTANTLY transferred to the Voomland real estate group owned by Instant Voom and Kerry Crabe. It was instantaneous, happening the exact moment that I marked the land for sale. I received no payment. I’ll post more information when I learn it, but for now, exercise extreme caution if you are marking land for sale in the Second Life mainland. If you do mark land for sale, check immediately to make sure you still own the land! I want to emphasize that I don’t know yet whether this was a Linden Lab error or whether the blame lies with Voomland. I’ll post more about it as soon as I know more. If you’re looking for a way to make a contribution in Second Life to relief efforts for victims of Japan’s earthquake and tsunami, I’ve written two articles for examiner.com that give six ways you can help. You find five ways listed in yesterday’s article www.examiner.com/second-life-in-national/ways-to-help-japan-second-life-1. You can learn about RADAR SL Magazine’s benefit at www.examiner.com/second-life-in-national/radar-magazines-japan-benefit-second-life. This month-long benefit ends on April 16. You can donate at a tip jar or you can purchase merchandise with proceeds going to Japanese relief. Japan needs our help. Please donate even a little if you can.